Two weeks ago I posted an essay about the kids taking karate, and many of you wrote to tell me how touched and inspired you were by our story. I thank you for your kind words. I was also moved by Jack’s new-found love of martial arts and enjoyed watching our kids share in an activity. It was good, clean fun all around. Until my husband suggested we take “Cariello Karate” to another level, a level where he and I also participated. Where we both donned crisp white pants with an elastic waistband and vest-y things that belt around our middle, mysteriously known in the martial arts circle as a gui. (Or maybe it’s giu.) Where we, along with our children, would kick in the air and shout ki-YA at imaginary opponents. I thought this was taking the whole love and loyalty and family concept just a smidge too far. Finally, I broke down and admitted the real reason I couldn’t do karate: I would not be caught dead in that uniform. The billowy pants, the jacket that stops short of my wrists, the brightly colored belt. I am not a fashionista by any stretch, but I do understand what flatters a five-foot nine, thirty-eight year old chick who has birthed over forty pounds of people. And an entire outfit of monochrome cotton ain’t it. Plus I do not wear white after Labor Day. But, my family was insistent that we all do this together, and so I e-mailed the studio to ask if Joe and I could be included in the class. I was hoping they would say something about it being just for kids, parents are discouraged from getting involved. No such luck. Master Stewart wrote right back “The family who practices together stays together”, or some such nonsense. And so, come 2:30 on a beautiful Friday afternoon, I climbed into my uniform and floated downstairs like the stay-puff marshmallow man. Jack took one look at me and shouted “You look WEIRD!” By the time we got to the studio my entire family was smirking in my direction, even three-year old Henry. Needless to say, I was the tiniest bit huffy about the whole thing. But being the good, generous sport that I am, I joined in with Joe and the kids and practiced. And during the middle of class, as I was watching Master Stewart demonstrate some punching move, I saw something colorful flash on the bottom of his black uniform. 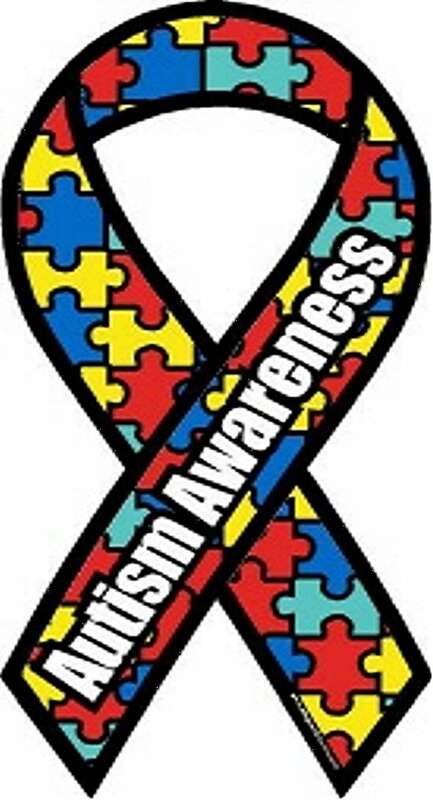 I recognized it at once: the autism ribbon. And for the remainder of the session, as Rose punched and kicked and shouted KI-YA in my ear, I thought about what uniforms stand for. They stand for things like community and kinship. They stand for familiarity and unity. They say hey I’m a part of this group of people and they mean something to me and I believe in them. With his carefully stitched ribbon positioned on the hem of his uniform, Master Stewart told me something significant. He told me I may not understand the tantrums and the long wait to hear him speak and the fear that ran through your very soul like icy water down a smooth rock, but I will try. He told me Jack is welcome here and we accept him. His ribbon said you are not alone, now we are here together. His unspoken message was powerful and loud; we belong. Jack belongs. And for a family who has sometimes struggled to find a place in the community that speaks to each of us, finding a space where Jack’s autism is understood and even valued is very meaningful. That’s what a uniform can do. And now I am proud to wear one, too. I’m just hoping the kids never take up wrestling. Because no way am I wearing a unitard, even if I could stitch a ribbon on it. Joey and I at karate. Hello Mary! Great to hear from you! Thank you for your kind words….I just finished my first book, I’m in the second round of edits now. It’s called What Color Is Monday? and should be out in April of 2013. Thank you for your support! How about we make a deal that no one lets anyone wear a unitard. Ever. Deal? One of the most comforting things about karate with Master Stewart is knowing he accepts each one. That does SO give me hope that others will begin to as well.